WTH?! (What the Heck?) moments are attempts to find the memorable and the off-beat perspective on Longhorns sports. Here are some interesting moments from the Texas’ game against the Bears. Special Shout Out to Colt McCoy for having his number retired. Thanks #12 for 45 great wins! 1st Quarter (12:11) WTH Karate Kid?! Let’s not worry about the karate kick that Sam Acho delivered on QB Robert Griffin. The sack, fumble recovery and all out effort all game long proved to the 100,452 in attendance who is the defensive leader. 1st Quarter (9:23) WTH Matthews?! This play sums up the entire season for the Horns receivers. The right play was called but the concentration was not there. TE Barrett Matthews stone hands had a sure touchdown bounce off of them. On a positive note Garrett Gilbert played his best game of the year! 2nd Quarter (8:51) WTH Williams?! 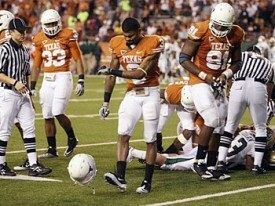 I hope the Longhorn receivers watched the excellent catch by Baylor’s Terrance Williams. The officials had to review it because they did not believe it. Now that is how you catch a bad pass! Great effort! 2nd Quarter (8:04) WTH Butter Fingers?! Both Alex Okafor and Keenan Robinson failed to recover a crucial fumble by Baylor. Both were trying hard to make a play but this team needs positive results. 2nd Quarter (:43) WTH Coach Blood?! Coach Muschamp calling a blitz on 3rd & 10 against the Bears when you have held them in check for most of the game? The play exposed Blake Gideon’s lack of tackling and the Bears had the first TD of the game which covered 59 yards. 3rd Quarter (10:05) WTH Defense?! Great job by Christian Scott for intercepting the ball and returning it to the Baylor 40 yard line. Too bad your defensive teammates were too eager to add two huge penalties to put the Horns back at their own 15 yard line. 3rd Quarter (1:18) WTH Briles?! I love the cool customer that is Baylor Coach Art Briles when he called two timeouts in a row to make sure he had the right 4th down call. Bears started the 4th quarter with the go ahead touchdown and all the momentum on their side. 4th Quarter (2:34) WTH Brown RD2?! Curtis Brown needs to be relieved of his punt return duties not because of his lack of skill. He was trying to make something happen when there was nothing to be had. His fumbled was recovered by Jordan Hicks but the subsequent unsportsmanlike penalty by Curtis put the Horns in a huge hole. Next up for the Longhorn’s are the Wildcats of Kansas State in the “Little Apple” on November 6th. Thanks for following my WTH articles throughout the season. I appreciate the opportunity to rant about the greatest University sports program in the country. You can continue to follow comments on all of UT sports on twitter at 40AcresSports or follow me at Horns1991. HOOK EM!! WTH?! (What the Heck?) moments are attempts to find the memorable and the off-beat perspective on Longhorns sports. Here are some interesting moments from the Texas’ game against the Cyclones. 1st Quarter (15:00) WTH Horn Fans?! Forget the 11AM kickoff, your Longhorns come back from an upset (did I say upset?) victory over the Huskers. The students did not come ready, the alumni fan base was not ready and we found out that the team was sure not ready. 1st Quarter (5:23) WTH Defense?! Last week we lauded the efforts of the defense and Coach Blood’s game plan. No game plan this week? The Cyclones put an 80 yard 6:37 minute drive together for the game’s first score. 2nd Quarter (13:01) WTH Williams?! I think it’s a weekly item to call out somebody named Williams. Aaron Williams is trying to get his draft stock higher with multiple duties. Returning punts better not be on his resume again. 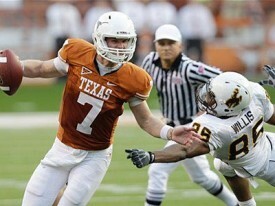 He failed to fair catch a punt that ended up rolling 74 yards to put the Horns down at the 1. 2nd Quarter (:29) WTH Red Zone?! Greg Davis needs to trick things up or we will never get in the end zone. It looked like the game plan was to out talent the Cyclones. Too bad effort was not added to the plan. Oh yeah, we missed the field goal to end the half. 3rd Quarter (10:55) WTH Monroe?! Either DJ Monroe needs to be kicked off the team for his past transgressions or give him more carries. He touches the ball once and sprints for 10 yards and a first down. Mack if you are trying to teach him a lesson. Give him the ball more. DJ Monroe and Malcolm Williams are the two biggest mysteries on this team. 3rd Quarter (2:42) WTH Vaccaro?! The arrogance by the Horns was clearly evident when Kenny Vaccaro immediately points to Christian Scott after the Cyclones put up a touchdown in the back of the end zone. Kenny points to Christian like it was his fault that the touchdown occurred. This team needs an attitude adjustment. 4th Quarter (3:09) WTH Muschamp?! Coach Blood needs to be called out for his arrogance of putting out his base nickel defensive package when Iowa State is clearly running the ball to drain the clock. 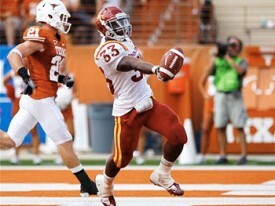 The decision to out talent the opposition resulted in the Cyclones getting a crucial first down to salt the game away. Next up for the Longhorn’s are the 25th ranked Baylor Bears in Austin at 6:00 pm on October 30th. WTH?! (What the Heck?) moments are attempts to find the memorable and the off-beat perspective on Longhorns sports. Here are some interesting moments from the Texas’ game against the Wyoming Cowboys. Texas QB Garrett Gilbert passed for 222 yards and found a new favorite target vs Wyoming. 1st Quarter (3:12) WTH Replay Booth?! I have officially seen the worst booth review in the history of officiating. After Wyoming punts the ball, a Cowboy defender rolls into the end zone with the football for a clear touchback. I believe even in the officials on the field were asking themselves are you kidding me. The play stood and the Horns took over on their 20. 2nd Quarter (3:24) WTH Fozzy Bear?! We have a new starting running back at Texas. Fozzy Whittaker rumbled through four tacklers on his way for a 39 yard touchdown that even Earl Campbell would be proud. He finished as the leading rusher for the game… with 62 yards? 2nd Quarter (1:48) WTH Davis?! Be ready for this tandem to strike for many more touchdowns, when Garret Gilbert hit Mike Davis on a quick pass that Davis took it the distance for a 45 yard touchdown to seal the game. The freshman wide receiver lead all pass catchers with 104 yards for the evening. 3rd Quarter (6:00) WTH Late Flag?! Blake Gideon lit up a Wyoming receiver which resulted in an incomplete pass. The hit brought back memories of a Longhorn great John Hagy. The ref decided to throw a flag because he thought it was a flag football game. I loved Coach Blood’s assessment of the bad call as “it is better to say Whoa than Giddy up” to his fired up defense. 3rd Quarter (1:38) WTH Cowboys?! Not only was that fake field goal poorly executed to try and gain some momentum. The camera shot of your oldest fan wearing nothing but a yellow Wyoming barrel was another empty and disturbing moment. 4th Quarter (12:01) WTH UT Fans?! Seriously. Did you not know that the “Wave” is old and out dated? Glad to see that a 29 yard pass completion by the Cowboys put an end to that effort. The Hellraisers with Fox Sports Jim Knox was another fan forgettable moment. End of Game WTH UT Tower?! I enjoy seeing the tower lit orange on the Godzillatron minus the kids trying to get in the camera shot. But as much as we want to show our spirit and tradition after winning a game, it would have been nice not to see the Tower clock at 6:30 when the game was over at 9:30pm. Next up for the Longhorn’s are the Red Raiders in Lubbock at 7pm on Sept. 18th. I hope that we are all happy as we start heading into the new season with a brand new quarterback and new expectations. The past five years have been an incredible run for the Longhorn football team with more wins in the programs history than at any other time in our 127 year history. “The Kick” coupled with the maturation of one of the greatest Longhorn players, Vince Young, brought us the momentum we needed to achieve greatness. This greatness was realized the very next year with a 13-0 record and a BCS National Championship when the Horns beat the glitzy boys from Southern Cal 41-38. The ultimate responsibility of following up such a legend was laid upon the shoulders of a young face quarterback from Tuscola Texas. That young player named Colt McCoy had the support of an energized and confident coach in Mack Brown to continue that success for the next four years. Those four years culminated in three bowl wins including a Big XII championship. This historic kick put the Longhorns once again on the brink of success in the BCS National Championship game until the story book run came to an end. 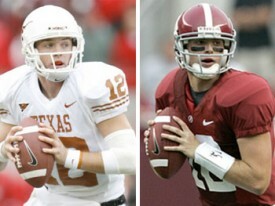 Colt McCoy none the less provided more wins than any Longhorn or college quarterback has ever delivered with 45 wins. Why do I recap these moments that everyone clearly has experienced themselves? The reason is the fear that we will forget the past and not appreciate the run as we start the 2010 season. This year’s team is loaded with standout defensive players all led by Coach Blood. Our offense has a few question marks, but blue chips can be found including the quarterback who grew up quickly before our eyes against Alabama. I know that we have questions at running back and we are changing our offense scheme to be a more running team, but we should win every game, right?! I feel good about going into this year but not with the type of success that we have seen around here over the past five years. Garrett Gilbert is the real deal, but I see growing pains along with our offensive line struggling with him. I still see us reaching 10 wins, but I see that 10th win coming at Jerry World (aka the Cotton Bowl) after we finish the regular season 9-3. Who will we lose to… be sure to check out all of our predictions at 40 Acres Sports throughout the season before every game. I hope that I am wrong, but I do not see Dusty Mangum or Hunter Lawrence on our team so I will just appreciate the season before us. 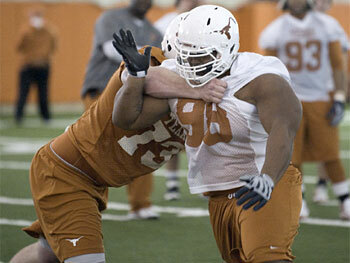 After nearly two whole months without Texas football, Friday was finally the first day of Spring practice. No tidbits yet (practices are closed to the public) but the official site does have a short video to watch and a nice photo gallery as well. Muschamp clarified his intentions Wednesday night. “I’m happy at Texas and plan to be here for a long time,” Muschamp said through a Texas football spokesman. He added that he has not interviewed for any other jobs nor does he have intention to do so. While Muschamp did not address any specific rumors or schools, his name has surfaced most recently at Tennessee after Lane Kiffin was hired at Southern California. From this morning… Tennessee offers head coaching position to Will Muschamp? 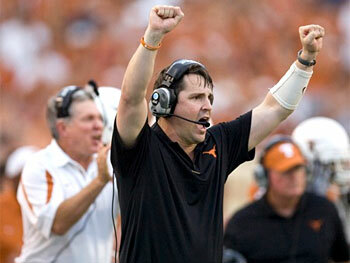 Defensive coordinator Will Muschamp will follow Mack Brown as next Texas head coach. Right? It’s been a wild day. This morning everyone’s sources within UT were 100% confident that Texas defensive coordinator [tag]Will Muschamp[/tag] wasn’t going anywhere. That was the story for most of the day. Orangebloods, Inside Texas, and the Statesman all spoke to multiple sources in the am and there appeared to be no issue, no smoke, and no chance the Horns would lose their big name coordinator. But the official confirmation never came. As the day wore on it became more and more troubling that the University had not made an announcement about Muschamp. Nothing official was coming out of Belmont. And coaches of high school recruits were reporting they hadn’t heard any status updates either. What in the world was going on? Will Muschamp had flown to Knoxville at 5:45 am to meet with Tennessee. Say what? From about 4 pm until 7 pm that’s all we heard. Everything from the morning seemed false. Not only was this a big name school who was interested in him, but Muschamp had actually already met with them in person. And no one’s sources had said anything about it. Three hours with no new news. That’s not good. Finally around 7 pm IT editor Ross Lucksinger tweets that, yes, Muschamp did meet with the little UT this morning but two sources have told him that Coach Boom turned down their $3 million offer and is staying at Texas. 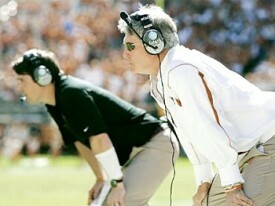 A Knoxville radio station reports the same and that the Vols are moving on in their coaching search. And finally, the saga comes full circle and all the news is once again that Muschamp is saying and more importantly the Texas staff is calling up recruits to tell them. Orangebloods and Inside Texas are now both reporting that recruits are starting to hear from the staff that Coach Muschamp isn’t going anywhere. Whew. That’s all we know. And I’m not even sure how much we know is true. If/when Texas finally makes an official we’ll keep you in the loop. Tennessee offers head coaching position to Will Muschamp? Will Texas coach Will Muschamp be wearing the wrong orange for the wrong UT next year? Wow. The college football coaching dominoes fall fast. Saturday word broke that the Seattle Seahawks would hire USC’s Pete Carroll as their new head coach. Yesterday evening, instead of hiring Jeff Fisher or Jack Del Rio the Trojans bring in the obnoxious controversial Lane Kiffin after only one year at Tennessee. That started “riots” in Knoxville. Are riots in Austin next? According to Volquest.com, Texas defensive coordinator [tag]Will Muschamp[/tag] is at the top of Tennessee’s wishlist and they have reportedly already offered him the position. Muschamp is one of the two highest paid coordinators in the country and has been named Texas’ head coach-in-waiting, but head coach [tag]Mack Brown[/tag] just signed another contract extension and looks like he could be at Texas for several more seasons. Muschamp also does not have a buyout in his contract, meaning it would cost Tennessee nothing beyond his salary to get him out of Austin. Muschamp has repeatedly stated that how much he loves Texas and loves Austin and that he intends to stay the defensive coordinator for the Longhorns until it’s his turn. But things change. Is the opportunity to be the head coach of an SEC power too good to pass up? Both Geoff Ketchum of Orangebloods.com and the Statesman’s Suzanne Halliburton have reported last night and this morning that every source at Texas they talk to says Muschamp is saying. The one person no one has talked to is Muschamp himself. I don’t expect the Muschamp rumors to last past today, this thing is going to go down fast. Either the school will make an announcement he’s staying (and probably a raise) or we’ll find out he’s gone. We’ll have more news when we hear it. Follow along live with 40 Acres Sports on Twitter and below for our thoughts and analysis during tonight’s national title game on ABC. We’ll be live right around kickoff for Texas vs [tag]Alabama[/tag] so join us to discuss the game at 7:00pm Thursday night. Things might be a little less wordy than normal, but please feel free to leave comments and questions using the live tool, but not all comments will be published. Read below for more notes on comments and how the live blog will work. Hook ’em! It could come down to which QB plays best. Who would you choose? McCoy or McElroy? Here we go ladies and gentlemen. The king of college football for the 2009 season will be crowned tonight at the Rose Bowl in Pasadena, California. In front of a every sports fan in the country, the #2 Texas Longhorns will take on the #1 Alabama Crimson Tide for all the marbles. In a few hours the winner of the Citi BCS National Championship Game will hold up the crystal football and have a moment they will never forget. Matt – This season and game reminds me a lot of the 2005 National Championship run, but I love being the underdog and overlooked by most people in the nation. All I keep hearing about is how good Alabama’s defense is and how they dominated Florida. Well I have watched quite a few of Alabama’s games this year and I think some people need to go back and watch film on the Alabama vs Tennessee and Alabama versus Auburn games. I think the key to the game will be if Texas can get off to a fast start. It seems in almost every game this season Texas just goes through the motions in the first half, makes some adjustments, and comes out on fire in the second half. That simply won’t work in this game. A lot of that responsibility will be on Colt McCoy. He needs to take over the game early and do whatever it takes to start off strong, even if that means running the ball more like he did in the A&M game. texfan23: im going with 37-15. Colt has. +300 Passing, tre gets +60 with a big run over 20. ET gets a Pick 6.
livingnearshamu: UT 24 UA 14 Hook ’em ‘Horns! whitneyredman: Here’s my prediction. My stomach will be in knots all night and I will come down with a stress fever. Hook ’em.